IN MY CAR TEST: Jl 12w7 vs Morel Ultimo 12 SC vs Phoenix Gold Ti12d Elite! Re: IN MY CAR TEST: Jl 12w7 vs Morel Ultimo 12 SC vs Phoenix Gold Ti12d Elite! Thanks to the OP and all contributers to this thread. Special thanks to FartnInTheTub - I cannot remember when I last laughed so hard - I've been through some tough times lately, and this has been VERY therapeutic. i dont really know if i want a SQ sub or an SPL one. the above comment has made me consider an SPL one. i dont need huge ground shaking bass, but i dont want a quiet sub either. By the way, reading this post the optimal sealed enclosure size people are going for is 1.25cu ft. why is this? the manual states the 0.998cu ft is the optimal. all companies make a "generic" for the mass public size optimal box, my JBL GTI 10's are listed at .75cuft, too punchy at that size box, i use them in a 1 cuft sealed box and get better extention / lows. the higher the frequency the sub will play, and the more power it will handle. 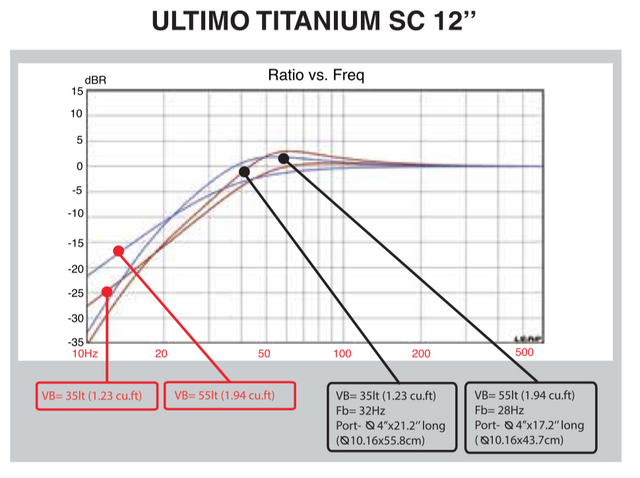 I'm thinking of getting the UltimoSC 12" for my car and not sure about what size sealed enclosure - the manual suggests 1.94 Cu Ft is optimal, but I'm metric and lost, can someone share some guidance on what type of sealed box I need? Ideally external dimensions in cm - does it need to be a perfect square? I see some boxes with an angle on the back... Ideally I'd prefer the smallest possible but I understand a bigger than minimum has it's advantages. I also heard the Ultimo SC 12" is slightly smaller in diameter compared to normal 12" subs so doesn't fit generic 12" sealed enclosures, is this correct? Actually I thought it suggested 0.94 cubic feet. General usage-based recommendations suggest 1.3-1.4 cuft. Showing sealed and ported volumes. That's how I understand it...? That's the Titanium SC, not the SC 12. If you're looking at the Titanium SC's then they recommend 0.706 cuft - 1.76 cuft. I'd still feel good about 1.3-1.4cuft. This old thread is from 2011. This is what've I've consistently heard too. They seem to like 1.3-1.4 cuft. I ordered a 1.6 cuft enclosure for the Ultimo SC 12" - I wonder if its too much now? Should I add some fill? What does it mean that a larger enclosure limits power handling? I want to power it with two channels of a Mosconi AS 200.4 - generating 640W @4Ohm (the sub is 4 Ohm). Lastly, how high do you set your HPF for this sub, is 100hz too much?